At Club MAC Alcudia, we have so much going on at ‘home’ in the resort that we know you’ll be entertained every night of your stay. But we don’t want you to miss out on exploring Alcudia as well. We are situated in a beautiful area of Majorca, with plenty of beaches, historical sites and countryside to explore. We also have some lovely areas to visit in the warm summer evenings. We’ve just started our shuttle bus to the marina for this year. It runs from Club MAC to the Alcudia Marina from 19:30 to 22: 30 every evening. It’s an easy way for all the family to go into Alcudia and explore the restaurants, bars and shopping in the area. As well as these popular holiday pursuits, it’s also delightful to wander around the marina, admiring the yachts moored there. 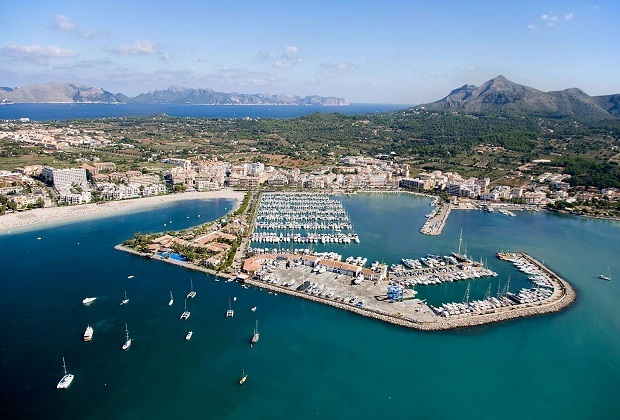 It’s a large and busy marina with 744 mooring areas for all kinds of boats and yachts. You may even see the super yachts of the very rich visitors to the island – they’re a magnificent sight and well worth seeing as the night draws in. We know that you’ll love our all-inclusive food and drink at Club MAC but trying local food is always fun. There are plenty of restaurants and cafes around the marina, serving up local specialities, fresh seafood and holiday favourites like fish and chips and Chinese feasts. We love Can Punyetes for excellent Majorcan food, Miramar for fish and rice dishes, Casa Gallega for Galician seafood and Don Vito for an Italian style dinner. New Cacao is a good choice for modern twists on old favourites like burgers and tapas. You’re guaranteed to find something to please everyone in your family, even the pickiest of eaters! The marina has a lot more to offer than food, however. There are some fun bars and places to chill out with locals and other tourists. In peak summer months, the marina is a bustling and exciting place. Expect to see all kinds of street entertainment at peak times, and mingle with crowds admiring the sunsets over the sea. There is a market selling all sorts of lovely trinkets and souvenirs from Wednesday to Saturday. It’s a great place to pick up something special for the family back home. If you only have one evening out during your time at Club MAC, we highly recommend visiting the marina. It’s the perfect summertime holiday experience. As well as the bus to the marina, we have a day time bus running to the beach on a regular basis. We’ve just added a new stop to the usual route. The first stop is just past the Hotel Vanity Golf club, which is close to the port and shops. The second near the Sunwing apartments is a great place to get off the bus if you want to hit the beach.